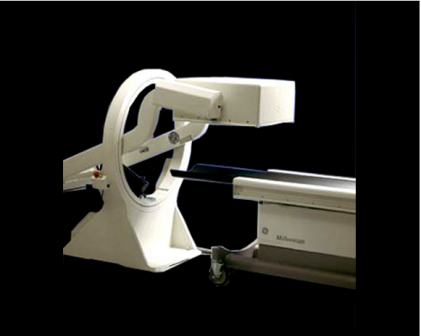 The GE Millennium® MPR and MPS Gamma Cameras are multi-purpose single-head nuclear medicine imaging systems, comprised of a Digital CSE™ multi-purpose rectangular (MPR) or square (MPS) detector, a pass-through counter-balanced ring gantry, a 3-axis universal imaging table, a GENIE® Acquisition station and high-performance collimators. The Millennium MPR and MPS feature static, dynamic, whole body (WB), multi-gated cardiac, tomographic, and gated tomographic nuclear medicine studies. GenieAcq premium acquisition station includes DICOM worklist and other productivity tools.